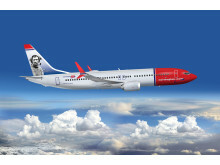 Norwegian and the Crean Family have announced that Irish Antarctic explorer Tom Crean will become its first Irish tail fin hero – the explorer’s portrait will appear on the airline’s new 737MAX aircraft that will serve new transatlantic routes from Cork, Shannon and Dublin to the US East Coast this summer. Born in County Kerry in 1877, Tom Crean joined the Royal Navy aged just 15, quickly becoming recognised as an accomplished sailor. In 1901, a chance encounter with Robert Falcon Scott saw Crean join Captain Scott’s ship ‘Discovery’ for an exploration into the unchartered Antarctica waters – it would become the first of several polar expeditions undertaken by Crean that led him to become known as one of Ireland's greatest Antarctic explorers. Crean’s modest and humble personality meant that it is only in recent years that his extraordinary career received widespread public recognition, including a bestselling book about his life and even a Guinness TV advert created in his honour. Nicknamed the ‘Irish Giant’ for his strength and stature as well as his leadership qualities, Crean perfectly captures the essence of Norwegian’s tailfin heroes. Tom Crean’s granddaughterAileen Crean-O’Brien has recently been adding to the Crean family story by recreating his expedition on the sub-Antarctic island of South Georgia – read more here. The Crean family said:"We are delighted to honour our grandfather’s bravery and courage by bringing his name and exploits to Norwegian’s many US and European customers. As our family continues Tom Crean’s legacy with our own Antarctic exploits, we wish Norwegian the very best in their new endeavours." 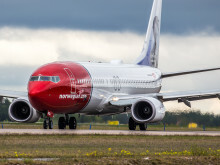 The new transatlantic routes will be operated on brand new Boeing 737 MAX aircraft - Norwegian is the European launch customer for this state-of-the-art new aircraft. 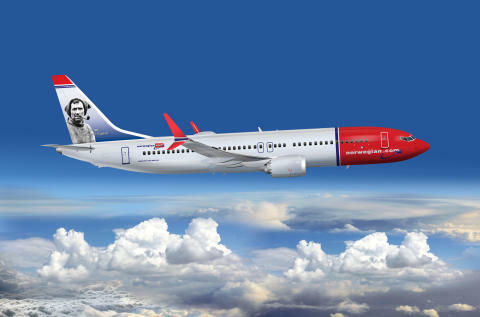 Tom Crean will be one of the first tail fin heroes to appear on the new MAX aircraft.